After the Ottoman Rule (1543-1686), Pécs returned to its status as a Catholic centre. Until 1780, the bishop was the city’s manorial lord as well. At that time, people of different faith were not allowed to settle in the city. Only in 1840, Jews were allowed to freely choose their residence in Hungary. Thus, Israelite families moved to the cities from aristocratic manors. In 1841, Pécs’ Jewish religious community was officially founded. In 1840, 72 Jews lived in the city; in 1869, the number had risen to 1.623. Due to rapid growth of the Jewish community of Pécs a second synagogue was built from 1865 to 1868, which is still in use today. It was built in the so called “romantic style” and was consecrated in July 1869. It was designed by Leopold Kauser, Friedrich Feszl and Karl Ferster. The synagogues ground floor has seats for 400 men and the same number of women can be seated on the two-story gallery. The interior design deviates from orthodox regulations: the sanctuary contains a choir loft. The Bima (gallery for reading of the Torah) is placed before the Torah arc and the building has its own organ. 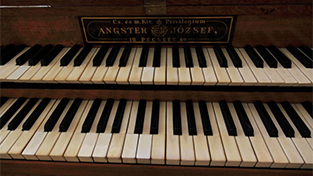 The instrument was one of the first products of local organ maker Josef Angster. It was completed in 1869 and its good reputation helped Angster’s workshop to a rapid ascent. 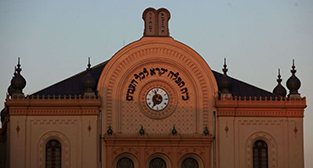 Until today, the synagogue is used by the Jewish community. Josef Angster’s first organ (1869).